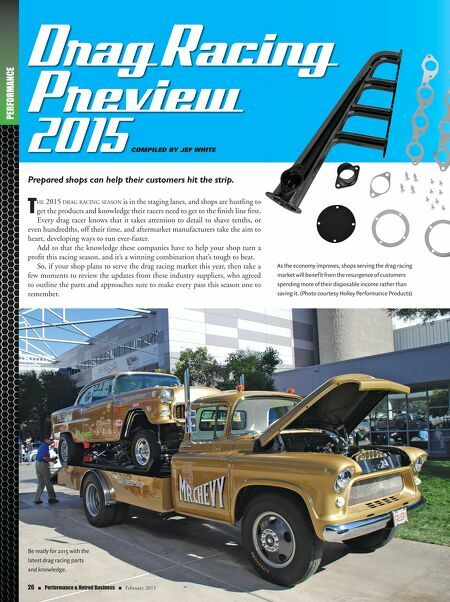 PERFORMANCE Prepared shops can help their customers hit the strip. T he 2015 drag racing season is in the staging lanes, and shops are hustling to get the products and knowledge their racers need to get to the finish line first. Every drag racer knows that it takes attention to detail to shave tenths, or even hundredths, off their time, and aftermarket manufacturers take the aim to heart, developing ways to run ever-faster. Add to that the knowledge these companies have to help your shop turn a profit this racing season, and it's a winning combination that's tough to beat. So, if your shop plans to serve the drag racing market this year, then take a few moments to review the updates from these industry suppliers, who agreed to outline the parts and approaches sure to make every pass this season one to remember. As the economy improves, shops serving the drag racing market will benefit from the resurgence of customers spending more of their disposable income rather than saving it. 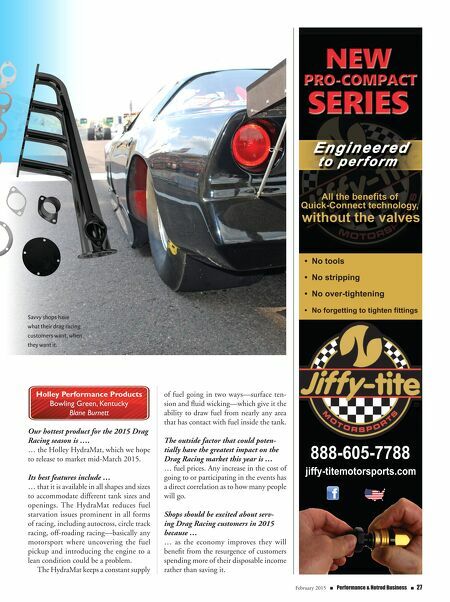 (Photo courtesy Holley Performance Products) 26 n Performance & Hotrod Business n February 2015 Drag Racing Preview 2015 Compiled by Jef White Be ready for 2015 with the latest drag racing parts and knowledge.